Summary: Why Should I Save Water? will teach students how important clean water is and how important it is to preserve it. Through heavy use of illustrations, readers are told and shown several ways in which they and their families can conserve their water usage. When Kirsty sees her neighbor wasting water, she tells him the dangerous of wasting water and what would happen if all the water was to disappear. Kirsty walks her neighbor through a list of things him and his family do in their everyday life that wastes a lot of water, and then teaches him how to conserve it. In the text, Kirsty teaches her neighbor, and the readers, that simple things like turning the faucet off when you’re brushing your teeth or washing full loads of laundry instead of several small loads will conserve water usage. How does it represent SJE6? Why Should I Save Water? promotes the understanding that our most important natural resource, water, is extremely important to our everyday life and it should not go to waste. Kirsty explains to her neighbor several ways he could conserve his water usage and then he takes that information and shares it with his family so they too can conserve their water usage. 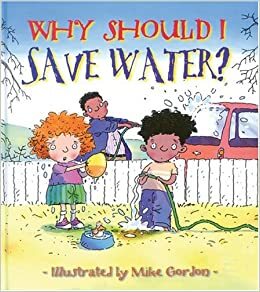 This book triggers a lot of classroom discussion and allows for students to take home some questions and discussion topics so they can be socially aware of their water usage at home and share that knowledge with their family. How would I use it? I would use Why Should I Save Water? by having the class create a list of things they use water for and if they believe their water usage is good or not and in what ways they can conserve water. Also, I think that an interesting approach to this book is to use it as an introduction to a unit about water conservation and the water cycle. I think if students understand when and how they’re using too much water, it could be a good idea to begin a lesson to teach them how the water got their homes to begin with and how the water cycle works.